Herb Kelleher, co-founder and Chairman Emeritus of Dallas-based Southwest Airlines, died Thursday at the age of 87. The airline posted online a long farewell to its founder, which can be read here. Kelleher's private funeral, for friends and family, will be held Wednesday at Christ Episcopal Church in San Antonio, according to a San Antonio mortuary. A public celebration of Kelleher's life will be held in Dallas at a later date. Kelleher was nothing short of a Texas icon. As legend has it, Kelleher and co-founder Rollin King sketched out their plan for Southwest Airlines in 1967 on a cocktail napkin. However, due to a prolonged legal battle, it would be more than four years before the intrastate airline would get off the ground. When the first flight departed Love Field in June 1971, the airline had just three aircraft and would fly 12 daily routes between Dallas and Houston and Dallas and San Antonio. From the beginning it was clear that Kelleher was running a different kind of airline. With a whole lot of moxie, Kelleher rocked the airline establishment with a simple idea -- that flying should be affordable for all Texans. "The air service at that time in Texas was a very poor quality and the prices were very high," Kelleher told CNBC. "We wanted to set Texans free because they were captive. There were monopolies in Texas in the air and we were out to destroy them." Along with cohort Colleen Barrett, Kelleher cultivated Southwest's reputation as the "Love Airline" for it's dedication to customer service. But even more important to the team known as "Herb and Colleen," was the way they treated their employees. "Employees came first. Employees first, customers second, shareholders third. If the employees serve the customer well, the customer comes back, and that makes the shareholders happy," Kelleher told CNBC. "It’s simple. It’s not a conflict, it’s a chain." It wasn't long before Southwest wasn't so little anymore, growing beyond Texas and spreading its wings from coast to coast. As it did, Kelleher became one of the world's most admired business leaders for his powerful blend of profits and personality. Kelleher led Southwest Airlines until 2008, but even after he stepped down he remained at the heart of the company's culture. 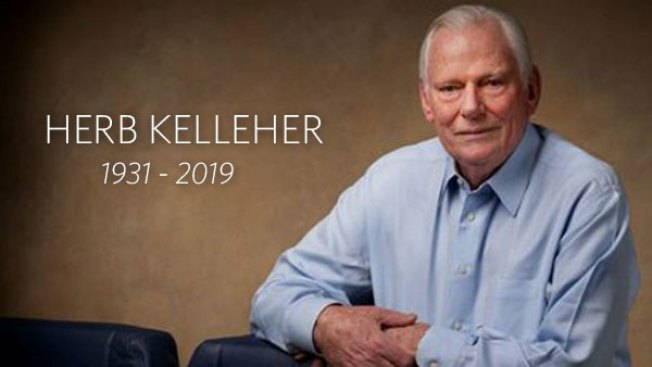 Herb Kelleher is arguably the most transformative figure and character in the history of modern aviation. He is the epitome of the can-do entrepreneurial spirit. My heart goes out to his family and all our @SouthwsrAirlines friends. Nearly 50 years after their first flight, Kelleher, in a 2017 interview with CNBC, said the airline is probably worth about $20 billion -- far more than the $500,000 in seed money used to create it. In that same interview, Kelleher shared why, despite the company's success, he never took a raise. "I always turned down pay increases, bonus increases, to set a good example for all of our people," Kelleher told CNBC. "Of course, the stock that I got rose enormously in value, but that was in lieu of cash compensation. It's what I thought was a requirement of good leadership." In June 2011, Kelleher was honored by the City of Dallas with the renaming of the roadway approaching the terminal at Dallas Love Field as Herb Kelleher Way. "This very sweet occasion was never anticipated in even my wildest dreams. And I've had some really wild dreams," Kelleher said. "When I heard about this, belatedly, I checked my pulse to make sure I was still alive, because I thought that streets were only dedicated to you after you were dead! This is really a sublime honor which, frankly, I cherish and treasure ... more than any that I have ever received." For more than three decades Southwest was restricted on where they could fly out of Dallas Love Field by the Wright Amendment. The legislation, by U.S. Rep. Jim Wright (D-Fort Worth), was put in place in 1979 to restrict interstate travel from Love Field and ensure that the newly created Dallas-Fort Worth International Airport was profitable. When the Wright Amendment expired in October 2014, Southwest could add nonstop service to an additional 41 states and Washington, D.C.
"It's nirvana for me," Kelleher told NBC 5 in 2014. "It's heaven because I have been waiting and working to get Love Field freed up for many decades." On Thursday, Southwest Airlines released a video of CEO Gary Kelly talking about the life and legacy of Kelleher. NBC 5 also talked to Dallas Mayor Mike Rawlings about Kelleher's impact on the City of Dallas and Love Field. Despite lasting legacies on the city of Dallas and the aviation industry, his greatest influence was perhaps the way he treated his employees. We spoke with Kelleher's former senior director of corporate communications, Ed Stewart, who called Kelleher a genius, a mentor and a joy to be around. “If you treat the employees well, they’ll treat the customers well, that’ll make the shareholders happy and everybody wins. And guess what, he was right,” said Stewart. The airline is now one of the largest in America and its business model has been copied around the world -- what can never be duplicated is Kelleher himself.